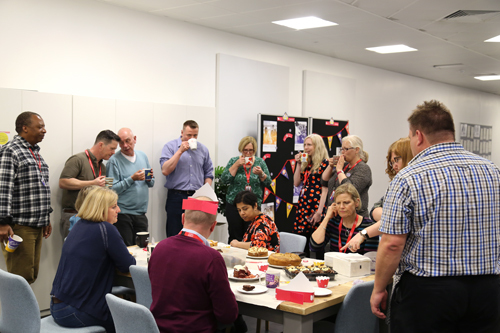 Nurses and staff from the School of Health Sciences celebrated International Nurses Day at City, highlighting the vital role that nurses play in society and at the university. At City, nursing has a long history as through the School of Health Sciences it dates its history back over 120 years and has historic links with the schools of the Royal London Hospital. Merging in 1994 with the respective school in St Bartholomew's Hospital to become the St Bartholomew School of Nursing and Midwifery, in 1995 the new school was incorporated into City, University of London. The day itself was initially started in 1965, but Dorothy Sutherland, an official with the U.S. Department of Health, Education and Welfare, had proposed earlier in 1953 that President Dwight D. Eisenhower proclaim a ‘Nurses' Day’, but it was not approved. Later in January 1974, 12 May was chosen to celebrate the day as it is the anniversary of the birth of Florence Nightingale, who is widely considered the founder of modern nursing. However in 1999, the British public sector union UNISON voted to ask the International Council of Nurses (ICN) to transfer this day to another date, saying Nightingale does not represent modern nursing and asking for more recognition of Mary Seacole, the pioneering nurse and heroine of the Crimean War. Each year to celebrate the day a service is held in Westminster Abbey in London. During the Service, a symbolic lamp is taken from the Nurses' Chapel in the Abbey and handed from one nurse to another. It is then placed on the High Altar signifying the passing of knowledge from one nurse to another. The ICN also chooses a theme for the year, ranging from ‘Nurses: Fighting AIDS stigma, working for all’ to ‘Mental Health – Nurses in Action’. This year’s theme is ‘Nurses: A Voice to Lead, Achieving the Sustainable Development Goals’. “I’m delighted that we have been able to take this time to celebrate this important day, which the International Council of Nurses (ICN) has celebrated since 1965. Nurses play a vital leadership role at City, in the UK and also internationally, so I feel it is fitting that the theme of this year’s celebration is Nurses: A Voice to Lead.